As a firefighter you have one of the highest risks for heart disease, pulmonary disease and cancer of any occupation and your Life Scan program has saved the lives of many of your own HCFR firefighters over the past seven years. As of last year, roughly 30% of HCFR personnel having a Life Scan were found to have anomalies that could result in loss of life if not treated. The Life Scan Wellness Program is designed specifically for firefighters as an annual health and fitness exam that focuses on early detection and prevention of the major diseases such as heart disease, stroke, cancer, diabetes, and aneurysms before they reach a catastrophic level. It provides you with a thorough assessment of your health as well as recommendations for achieving and maintaining long term health and managing medical risks. Life Scan’s sophisticated medical tests identify and analyze specific markers that are the foundation of virtually every disease, visualizes the health of the internal organs and heart, and evaluates the function of the vascular system. The 8-level fitness evaluation with our exercise physiologist will put you on the right track to an improved physical condition. HCFR provides this benefit at no charge to it"s personnel and it is confidential. They also offer the same physical to family members for only $330.00 each. They can also provide, a brain scan for $300.00 or a virtual heart cath for $300.00. spinal cord injury leaving him a quadriplegic. Now, at 19 years of age, he is paralyzed from the chest down with limited mobility in his arms. Nick’s father, Justin Battles is a Tampa firefighter so, the Hillsborough Firefighter’s Benevolent Assoc. and participating Beef-O-Brady stores did a fundraiser to renovate Nicks home in Wachula Florida, making it wheelchair accessible. They held a raffle for a superbowl package. The grand prize winner was Tracey Eversole of Wesley Chapel. The HFBA continues to assist the Battles family. If you would like to donate click on the "DONATE" button at the top left of your screen and follow the directions. through March 2013. 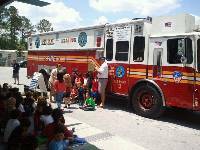 FDNY Rescue 5 will be on tour to various Fire Departments Throughout central Florida. Sgt. Joel Tavera could hardly make his way through his new home because many in the crowd kept congratulating and thanking him. Tavera, who was severely injured March 12, 2008, while in Iraq, was presented the four-bedroom, four-bath, 4,300-square-foot home in Grand Hampton on Nov. 19. It was built by William Ryan Homes in partnership with the Hillsborough Firefighter's Benevolent Association and Building Homes for Heroes, a nonprofit organization. THE 33RD NATIONAL VETERANS WHEELCHAIR GAMES are coming to Tampa in 2013. As the largest annual wheelchair sporting event in the world, the competition is sports at its best for our nation’s brave heroes. HFBA donates "Florida Fallen Firefighter Support Unit"
In the summer of 2011 the HFBA officers started to discuss the need for a statewide Honor Gaurd support unit. It came to our attention that larger departments like Tampa Fire Rescue and Hillsborough County Fire Rescue were going to the aid of smaller departments, to facilitate a fire depatment funeral. We thought how sad that our Brothers and Sisters, from smaller departments with no Honor Gaurd, had to watch as strangers performed the ceremony. So with that, the creation of the first "Florida Fallen Firefighter Support Unit" was in the works. We began fundraising right away and collecting donated items for the project. We consulted many Honor Gaurd units across the state. With help from friends like Hillsborough County Fire Rescue, Temple Terrace Fire Rescue, Clearwater Fire Rescue, Reedy Creek Fire Rescue, Anclote Fire and Safety, Star and Shield, FPF, the list goes on, we accomplished our mission. By January of 2012 we were ready to showcase it at the "2012 Fire Rescue East". The "Florida Fallen Firefighter Support Unit" contains class A uniforms, sound system, radios, flags, bunting, ceremonial axes and pike poles, practice casket, etc. everything needed to facilitate a fire department funeral. Any department without an Honor Gaurd may now provide a class A ceremony for thier own. This support unit is free for the asking. Any Department, Association or IAFF Local may make a request by contacting: Largo Fire Rescue Chief Doug Schwarz 727-235-8363 or any of the HFBA officers. daughter of Tampa Fire Rescue's Dave Dittman. birthday party every year to raise money to help other children.